The observations describing the event are defined by the nature or physics of the observable, the observation model, and the observer. 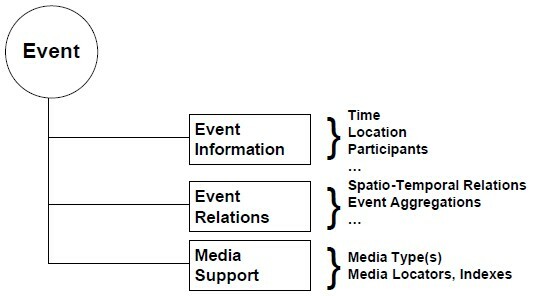 Because events are immutable, they are the cornerstone of every analytics application. Design system will threat Events as 1st class citizens. In an event driven architecture, the events are facts. Events are much more than just notifications. Events are facts that evolve and tell a story. The ability to track event causality and consequences is an essential step toward online decision support and important challenge for new algorithms for event mining. In some cases the results of the algorithms can be directly applied to the system (for example the event based control algorithms). Many monitoring problems can be also stated as the problem of detecting a change in the parameters of a system called event detection. Another important concept are event processing networks (EPN) such networks consist of event processing agents called event sources, event processors and event viewers. EPN have been applied for computer network monitoring. Sometimes, it is impossible to observe the events directly. In such cases the data are stored in databases in form of time series. This data represents observations of the system in selected points. The observations are analyzed by the system and alarms are generated in case of abrupt changes in the values of observations.